Despite the struggles of last season, Bulldog fans shouldn’t consider the 2012-13 campaign a failure. A lot was learned about numerous players during the final go-around in the WCHA, and that information should prove helpful at the start of this season. 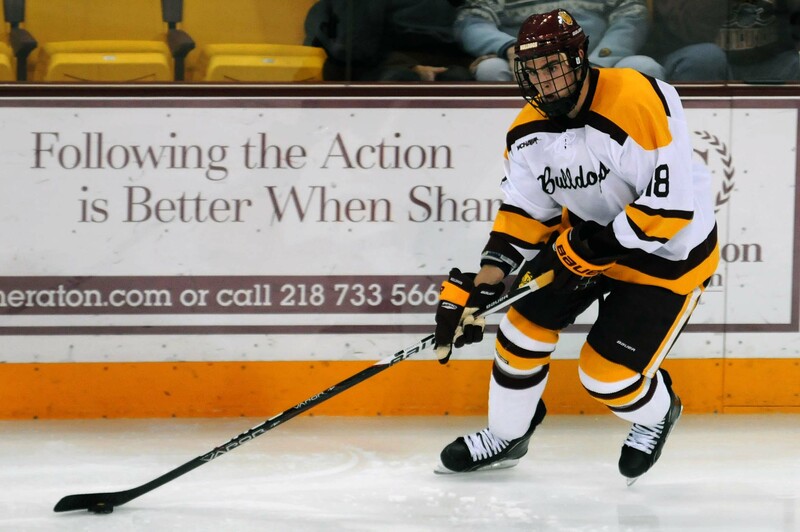 Speaking specifically about the forwards, UMD saw the emergence of two small, highly skilled freshmen. It saw the growth of some veterans that might not put up gaudy numbers, but will certainly contribute in less tangible ways. It also showed how much room to grow is left for some players on the roster. Now that we’re on the eve of a new season, it’s time to see what that all means. It’s also time to see some incoming rookies that bring high expectations and a good mix of skill sets inserted into the lineup. That’s why I’m looking forward to Monday. Exhibitions present that unique opportunity to mix and match while playing against someone else. So, it’s time to predict that possible lines could be. Please feel free to post your thoughts below. The Bulldogs don’t bring back a complete line that played the majority of last season together, but they have pairs of forwards that have shown chemistry. In my opinion, there’s three such pairs — Austin Farley/Tony Cameranesi, Caleb Herbert/Justin Crandall, and Dom Toninato/Alex Iafallo. Luckily, each combination includes a center (Cameranesi, Herbert, Toninato), which pretty much guarantees that UMD will start the year with good depth in the middle. Putting Basaraba on a line with Cameranesi and Farley seems natural for a few reasons. Obviously, these three played parts of last season together so they have a little experience as a line already. Also, you need someone that plays with good energy and has the ability to score on the top-line, and Basaraba brings that. He had a career year last season, registering career-highs in goals (10) and points (17). He’s also willing to get dirty in the corners and in front of the net, which should hopefully open up a little space for the other two. On top of all that, Basaraba is a right-handed shot. Sampair may not be the trendy pick on this line, but he is a left-handed shot and he does have some incredible speed. The other thing that suggests to me that Sampair can make the jump is how much he’s progressed in the past few years. In high school, he went from an average to slightly above-average player as a junior to a dangerous offensive threat and Mr. Hockey finalist as a senior. If he makes strides like that again, he could be a guy that not only has explosive speed, but also the ability to produce. Herbert and Crandall have shown throughout their time in Duluth that they play well together. There’s obviously some chemistry there, but both will have to increase their input on the scoreboard. This is probably the most intriguing line combination, simply because there’s two freshmen with a guy that plays a much different style. The reason for putting Krause on this line is because he’s responsible in his own end, plays well along the walls and will offer that safety valve for Iafallo and Toninato should they make an mistake or two early in the season. Obviously, Iafallo and Toninato had a ton of success together in Fargo, and all indications suggest that both are ready for this level. Toninato will quickly develop into one of the better centers in the league because of his ability to play in all situations and win draws. Honestly, this third line could be a nightmare for UMD opponents and prove to be the x-factor for the Bulldogs this season. This is the wildcard line. Both Tardy and Decowski are centers, but Tardy is probably a little better fit simply because he’s bigger and more experienced. Decowski showed signs that he can play a 200-foot game last year, but he’ll have to continue to grow. Spurrell produced points in juniors, but until he gets a little experience, it’s hard to put him in the top nine. I wouldn’t be shocked if he ended up with either Toninto/Iafallo or Farley/Cameranesi at some point this year, though. Osterberg and Young will find playing time throughout the year, too. I’m sure there will be plenty of rotation through the lineup as time goes on. Herbie will play wing with Alex and Dom on second line.